“Science Night Live” Science Café Series Launches November 5th in Lodi, Calif.
Live from Lodi, it’s Science Night! Starting November 2014, science enthusiasts in the Capital and Sacramento Valley region will have another science café series to follow. Science Night Live is the latest evening science experience offering to spring up in our area, thanks to the World of Wonders Science Museum in Lodi. The first-ever SNL event will be Wednesday, November 5th at 6:00 p.m. at the WOW Science Museum (2 North Sacramento Street, Lodi 95240). 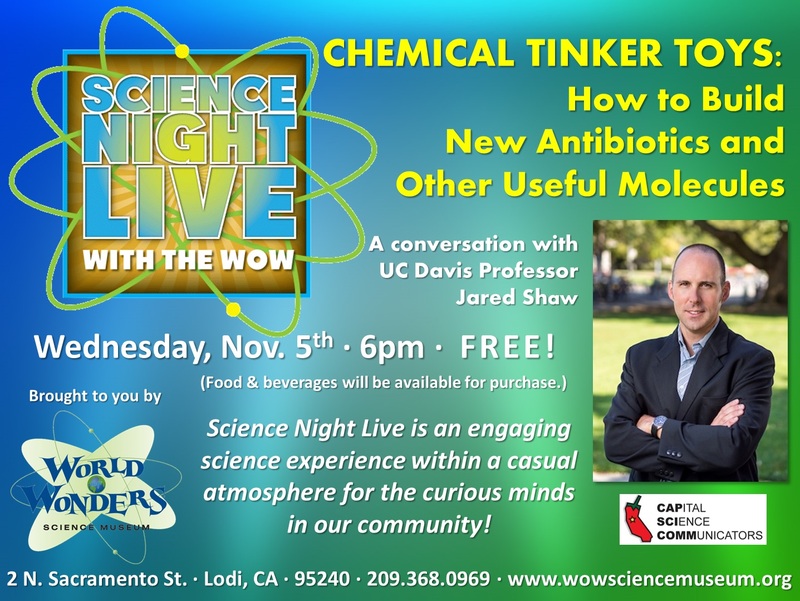 Fittingly, the inaugural guest will be Professor Jared Shaw of the UC Davis Department of Chemistry, who will chat about “Chemical Tinker Toys: How to Build New Antibiotics and Other Useful Molecules” that evening. Shaw, of course, is the founder and current host of the popular Davis Science Café series. The new SNL evening science series is the brainchild of Nick Gray, Education Program Coordinator at the WOW Science Museum. A recent arrival to the Capital Region, Gray had experience planning science cafés and trivia nights while living in the Dayton, Ohio, community, and now initiates and coordinates science education programs for the museum. CapSciComm: Tell us about Science Night Live. What’s your vision for this science cafe series, and who should come out and participate? Gray: Anyone with a curious mind should definitely make Science Night Live a part of their plans every month! SNL aims to promote a greater understanding and appreciation within our community of scientific ideas and discoveries through entertaining, engaging interactions with local scientists, their research, and areas of expertise. CapSciComm: Why did you feel it was important to start and bring an evening science experience to the Lodi community? Nick Gray: Besides just being fun to learn new things, in a world more reliant upon science and technology than ever before, scientific literacy among the population is crucially important. It affects everything from the public policy we legislate to the choices we make about our families. CapSciComm: How did you come into a career of science education? What do you feel are some joys and challenges of enabling science outreach? Gray: I have a degree in biology, but I discovered a felicity in science education following university as an AmeriCorps volunteer. After nearly a decade of teaching science in the classroom, I’ve come to the World of Wonders Science Museum to try to broaden the scope of my passion for scientific literacy. It can be difficult at times because many folks see science as only relevant to scientists. As I told all my students, though, I have no delusions of turning everyone I meet or teach into scientists, but I do strive for a future wherein more people appreciate the wonder of the natural world and can make well-informed decisions as citizens of this planet. CapSciComm: The WOW Science Museum opened in 2009, but might be still a new name for some folks. What can visitors expect for their families when they come by the museum during the day? Gray: The WoW is all about hands-on discovery! Whether it’s the over 60 exhibits on the museum floor, our on-site and travelling education programs, or even our science-based birthday parties, we think the best way to learn something new is to do something new. That ethos runs through Science Night Live as well! Every SNL event will include an activity related to the topic of the evening. CapSciComm: Thank you for your time, Nick! Nick Gray can be reached at nick@wowsciencemuseum.org. To learn more about science cafés in the Capital Region, visit our Local Science Café portal: www.capscicomm.org/local-science-cafes.